Barcelona is a big city. A noisy city. There are always loads of people. Especially in the centre of the city, obviously, since that's where most of the tourists are. One time a friend in Norway asked me how I managed to stay there over time and seem so happy about it. He had done a two week Spanish course there once, and had gotten totally stressed out about the constant noise and movement. He complained that the city never sleeps. I would never have complained about the same thing, coming from a relatively sleepy Norwegian city! I loved how vibrant and alive Barcelona is. How there's always something going on, events, festivals, how the cultural offer is immense and how you just can't really get bored. Or if you get bored, it's your own fault, not the city! But not all people like this, and anyway- sometimes us humans need to wind down and connect a little with nature, so I have collected some places where you can find peace and quiet, let your thoughts speak and not get drowned out by traffic and noise. Barcelona is sort of built in an uphill, and all the way up to the top is a huge green area, la Sierra de Collserola, actually said to be the largest metropolitan park in the world (as a comparison it is 22 times bigger than Central Park in NYC). It’s more like a huge forest than a park and it's not IN the city centre, but not far away either- just about 8 km from the heart of the city, Plaza de Catalunya. Collserola is great for a lot of different activities, such as walking, hiking, running, biking, walking the dog, picnics etc. but I wanted to point out La Carretera de les aigues. From different places you can access la Carretera de les Aigües, a 20 km long pathway running alongside the mountain with panoramic views to the city, perfect for walking, running and biking. The views are spectacular, the air is pure and it feels wonderful to be up there. On the weekends it gets a bit crowded but during the week, it's a serene place to be. FGC train from Plaza Catalunya to Av.Tibidabo. Then change to tram/bus or walk up the hill (beautiful 15min walk, just follow the tracks of the tram and you won’t get lost). Once up by the funicular going to the top of Tibidabo, keep on walking straight and after about 500m you reach the beginning of Carretera de les Aigües. Get FGC train Plaza Catalunya to the stop “Peu de Funicular” and change to the Funicular going straight up to Carretera de les Aigües. It leaves you right on the pathway. Parque de la Ciutadella: By many called Barcelona's green lung. This park is located quite centrally in the city, but is big and lovely. It has beautiful architecture (for instance the Museum of Zoology, Museum of Geology, the Parliament of Catalunya) lots of green, a little lake with rowing boats, and lots and lots of places to lay out blankets for a picnic or just reading in the sun/shadow. There seems to always be some kind of activity group there, practicing yoga, meditation, martial arts or drums and other percussion instruments. It's beautiful and peaceful- you can always find a quiet corner. How to get there: The closest metro stations are L1 (red) Arc de Triomf, and L4 (yellow) Ciutadella/Villa Olimpica. El Parc del Laberint is such a great surprise! It is located a bit out of the city centre and most other tourist attractions, and is mostly used by locals and the odd tourist that finds his way there/takes time to go a little out of the centre. Barcelona has so much to offer that I think this park wouldn't really get on the list of most tourists that have only a few days, but it's a really nice place to go. The park is located at another entry point to Sierra de Collserola that I talked about above, and is another great place for pure air and tranquility. The maze of the park is fun, but there's so much more. Beautiful sculptures, water (in different forms) a neoclassical garden, a palace, and then at the back of the park is where Collserola starts - perfect for a picnic! How to get there: Get on the Green metro line (L3) and take it all the way up to the stop Mundet. The park is just a few minutes walk from the metro station. This is a little secret! Hush, don't tell anyone! 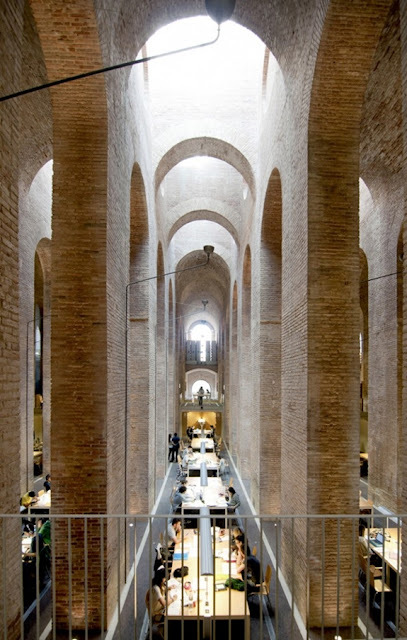 The library at one of the universities in Barcelona was once a reservoir building to store water for the waterworks in the afore mentioned Parc de la Ciutadella. 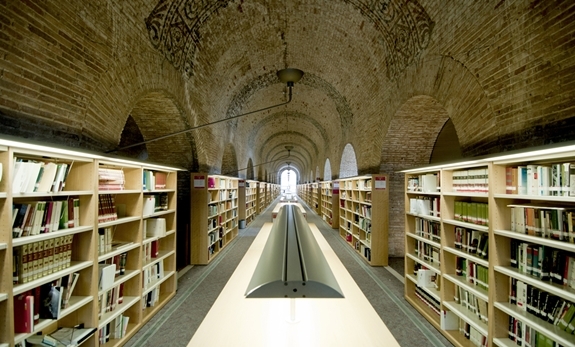 The library is located at the Campus Ciutadela of Pompeu Fabra University. I think the space is truly beautiful, the silence and the tall pillars makes it very special and almost ceremonious. And I love the fact that it is a somewhat hidden treasure in the bustling city of Barcelona. Not to mention my love for books, there is something so comforting about being surrounded by them! How to get there: For the beaches it's the yellow metro line (L4) you'll need to use. The stops Barceloneta, Ciutadella/Villa Olimpica, PobleNou and El Maresme i Forum are good stops. although if you go early morning during the week it can be a lovely calm place to be. My goodness...I'm missing Barcelona these days. My heart is a bit sad that I won't be going back this year. And that library? GORGEOUS!! Send me an email and tell me what you have in mind! Perfect timing! I'm enjoying my time in Barcelona and I was looking for new places to go to in this gorgeous city. when I lived in Barcelona I used to go to Montjuic to escape noise and people. it has some many things to offer and you can always find a new spot to discover. los patios de manzana (I don't know how to say it english)in Eixmaple are also a good place to relax. a quiet place just on the heart of the city. Montjuic is so nice too! Lots of great spots. The first time I went I got lost and didn't see anything worth mentioning, but later on I have seen so many lovely parts of Montjuic and it's a great place for green, calm and nice views! I have never heard of los patios de manzana, is it what it sounds like? Apple trees? I have learned to appreciate the peacefulness of Norway more and more lately, but of course it can get a little too quiet too :) Hope you're enjoying the summer and weather has been nice where you are too! We'll spending a couple of days in Barcelona next Spring. So will be checking back in and making notes. I'm not one who likes crowds or noise and so didn't want to add it to our vacation list; but hubby wanted too, and our travel agent said it would be silly to go to Spain and not see it. We'll be the first week in April, tell me what the weather will be like. I'm a bit unsure how to pack. Hi Sandy, Barcelona is fabulous, but very crowded. I agree that it's a great city to see when in Spain, but there are maaany other cities with a lot of soul and character too, that might be less crowded and noisy. Maybe you are doing a combo of several cities? Weather in April can be both warm and chilly... This year summer arrived late and it was cold in April, other years it's been what a Norwegian would call summer in April, so it's a little hard to say! Barcelona sounds like a dream. I hope I get to visit one day. I hope you do too! It's a great great city.